This year the weather god has been really generous, blessing us with beautiful long sunny days and cool breeze in between to keep our cheer high. So we decided to make the most of it. The days were spent with Lil Dumpling, mostly in garden, caring for the plants and painting under the shade of tree. We took a break by chasing butterflies, watching the ants gather food for the winter, twittering with birds, jumping on trampoline and having impromptu picnics. Come weekend, we packed our picnic baskets, slipped the flip-flops, generously slathered ourselves with sunscreen lotions and hit the local sandy turquoise beaches. While LD and K chased the frothy waves and caught jelly fishes, I did the hard work by lying on a beach towel under the bright sun, reading and dozing off in between! It’s really hard work, I say! We spent the whole day in beach, building sandcastles, digging deep to find crabs, body surfing and just getting tanned! Well, all good things must come to an end and the summer is officially over and the schools have re-opened a week ago! LD has started his big school last week and it has been extremely nerve-wracking for us, his parents! You don’t know if you should laugh or cry when your little boy tells the school head mistress that ‘going back home’ is what he likes most about school. :) I need to write another blog post detailing the school (mis)adventures! After a week of struggle to getting used to the new phase of our lives, we are slowly slipping into a comfortable daily routine. It took me a while get used to having the house for myself without LD. I wished for this ‘me time’ after months of giving all my attention and time to little busy body who kept me on my toes! To tell you frankly, it’s really not as great as I thought be and I terribly miss having him run around my feet. I have few hours to kill after dropping LD to school in the morning at 9 am. Once home, I check my emails, blog and Facebook page and reply to all the queries before cleaning the house and pottering in the garden. Then I quickly check my pantry and decide on what to cook for dinner. Yes, I cook 2-3 dishes every day and sometimes even end up spending hours making an elaborate meals. If I am in mood, I sit down to write a blog post which usually takes an hour or two and sometimes end up doing shooting the dishes that I cooked for dinner and editing the photographs. But mostly I find myself reading piles of books that I have collected over summer while some of my favourite singers croon in the background. It all lasts until 3 pm when I run to pick LD from school. As soon as I see his little head popping from the class room, my heart skips a beat and jumps up and down as he comes running to greet me. A quick hug and then he runs around his school playground challenging me to catch him if I can! :) We chat all the way back home, him mostly, telling me about what he did in his school, what he had for lunch and what I have made for evening tea as we walk hand in hand through the narrow footpath in the woods that resembles the path the mouse takes in search of nuts in LD’s most favourite story book ‘The Gruffalo’. It’s a magical path in beautiful woodlands lined with tall, giant maple and teak trees, blackberry bushes and a small rickety wooden bridge over a stream. Once home, LD runs to the kitchen to see what I have got in store for his evening tea. Apart from a bowl of fruits and a tall glass of chocolate milk, I make sandwiches, cakes, veg patties or dosas. 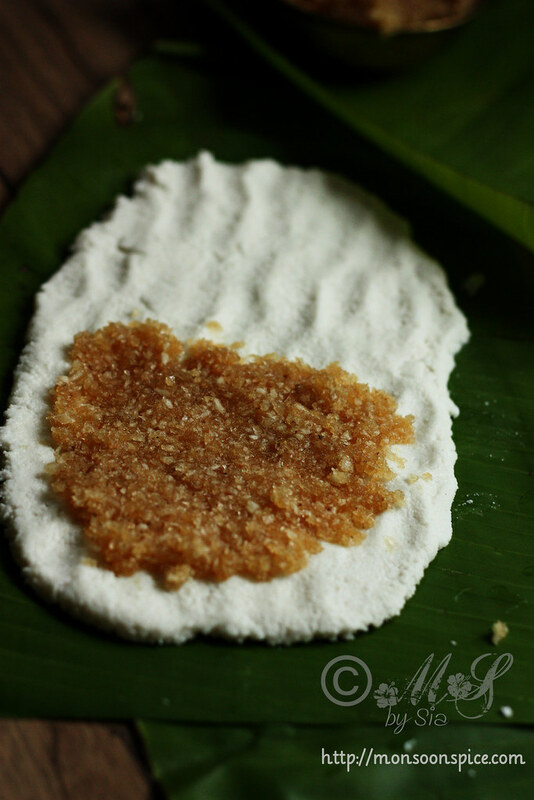 Other day I decided to make Ela Ada, a traditional delicacy from South Indian state of Kerala. 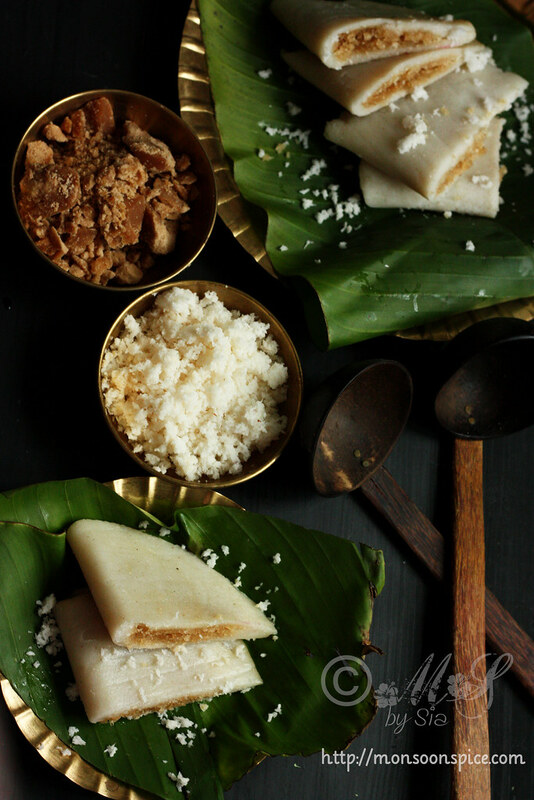 Ela Ada is a sweet coconut-jaggery stuffed rice flour cakes/parcels steam cooked in banana leaves. 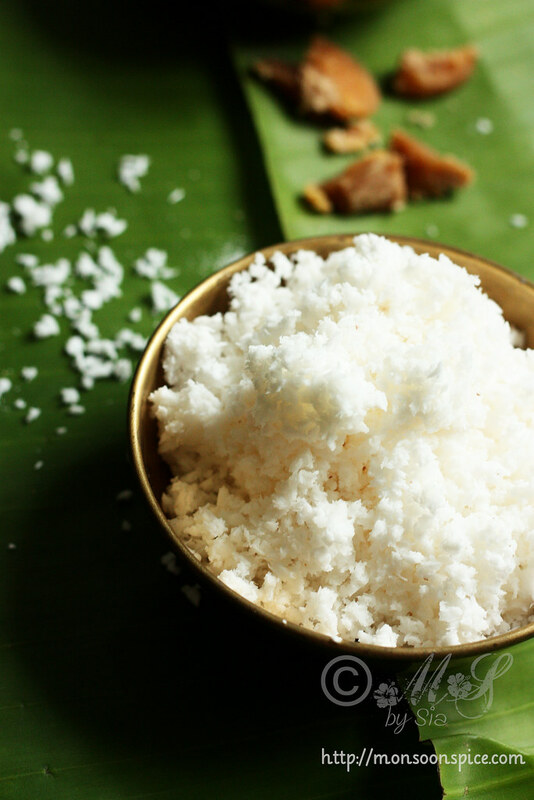 It is quite similar to Genasale or Patholi or Kayi Kadubu we make in my native of Udupi-Mangalore in terms the ingredients used and the cooking technique. 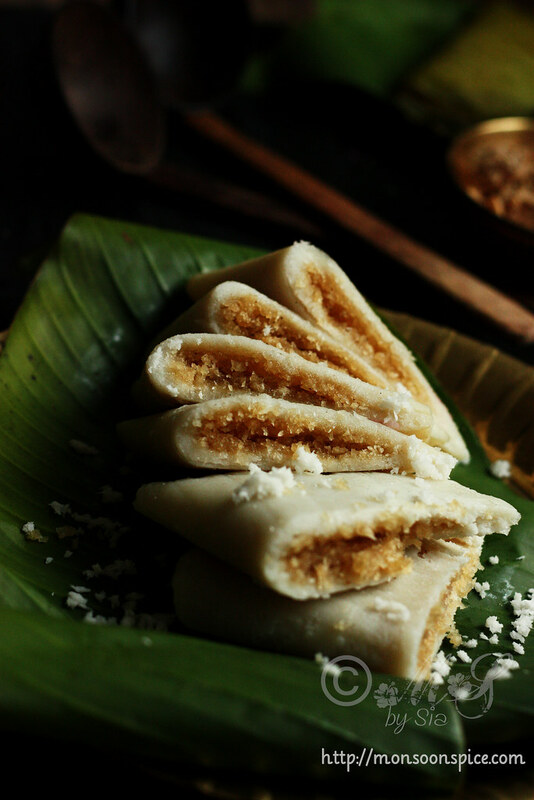 While the outer cover of Genasale is made using soaked rice batter, Ela Ada’s outer cover is made using the kneaded rice flour dough. Genasale has soft and delicate texture and easily breaks off, while the Ela Ada has little firm texture. Few weeks back I happened to get my hands on few banana leaves for a product shoot and I packed some of them in zip lock bags and popped them in a freezer. These banana leaves came handy as the Ela Ada cooked in them imparts beautiful aroma and earthy flavour that leaves us asking for more. This is a simple dish to cook and requires a handful of ingredients to make. 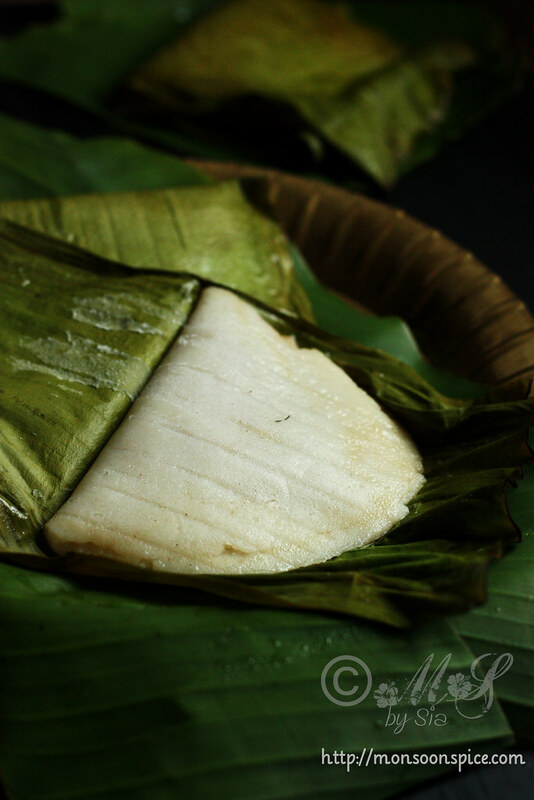 The simplicity of the dish with its sublime flavour and distinct aroma emanated during steam cooking wrapped in a banana leaves makes Ela Ada an absolute pleasure to all the senses. 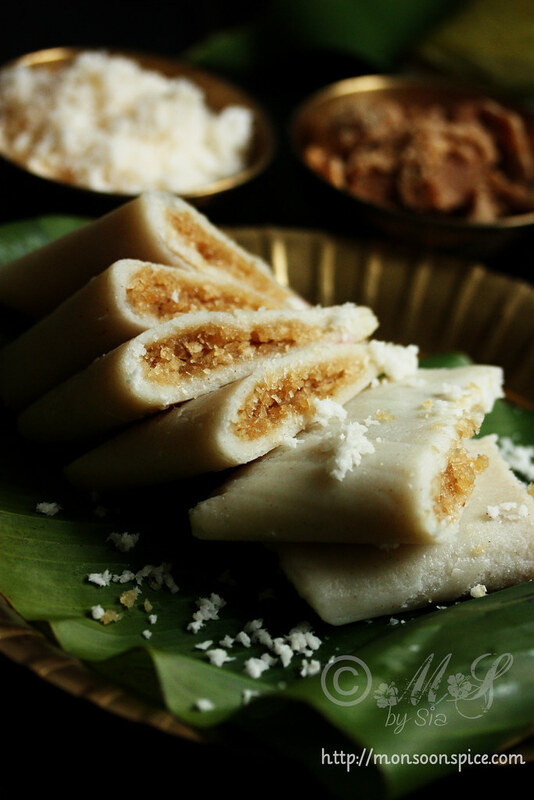 As a part of Ganesha Chathurthi celebration, I leave you all with best wishes and the recipe for delicious Ela Ada. 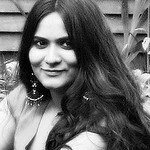 Wishing all the readers of Monsoon Spice and my blog friends, a very happy Ganesh Chaturthi! Wishing you all the happiness as big as lord Ganapati’s appetite, life as long as his trunk, trouble as small as his mouse and moments as sweet as his laddus! Melt jaggery in a sauce pan on low heat until it is completely dissolved. 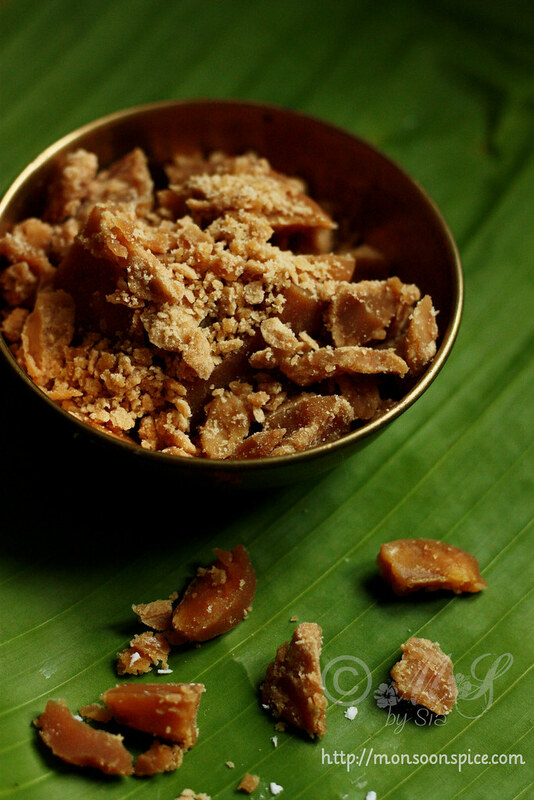 Make sure to stir in between to avoid the jaggery syrup from burning. 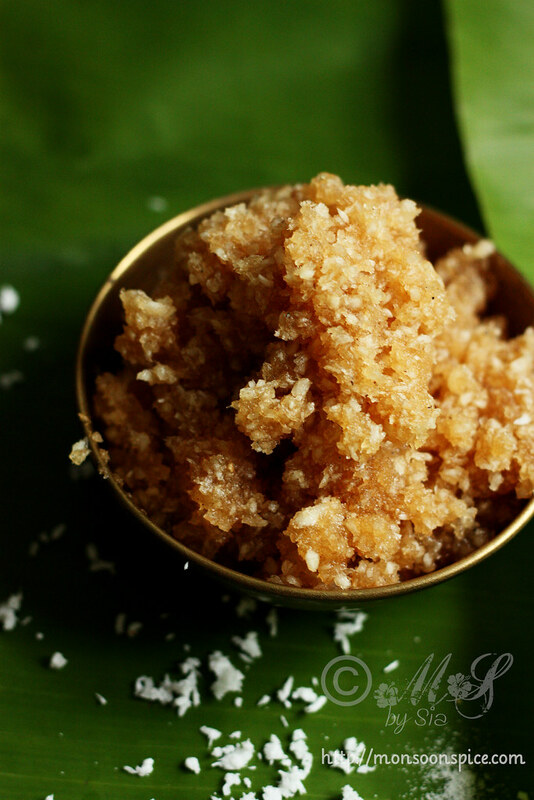 Pass the jaggery syrup through sieve to remove any impurities. Add the grated coconut, ghee and cardamom powder to the melted jaggery syrup and mix them all well with a help of a spoon. Keep it aside until needed. Take a rice flour and salt in a mixing bowl and add the hot boiling water, just enough to make soft pliable dough as you would for chapatti dough. First use the spoon to mix everything well and when the dough is just warm enough to touch, knead gently with hands to make smooth dough. Remember that the dough should be looser than the chapatti dough and be easily able to spread well with the help of fingers as shown above. Divide the dough into 6-7 equal parts and roll them to round balls. Take a small bowl of water and keep it aside. 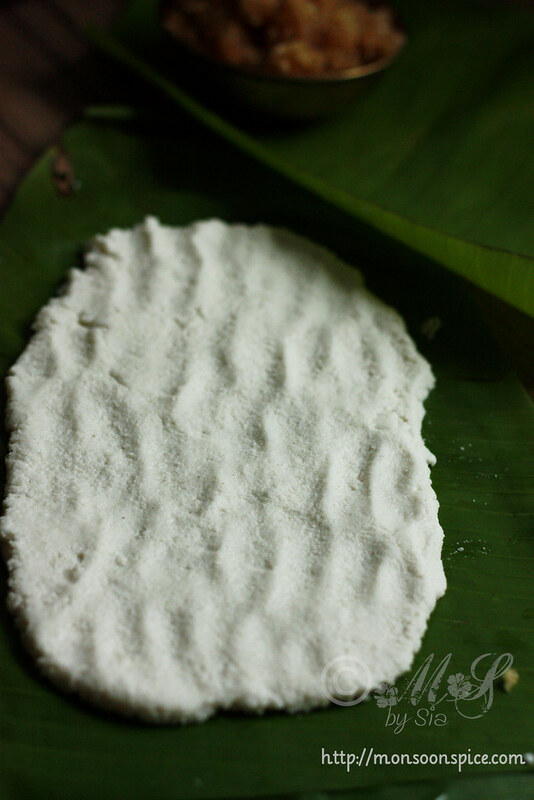 Take a piece of banana leaf, glossy part facing up, and place the rice dough ball in the center. Flatten the dough ball with the palms first and then gently start to flatten it with the help of a finger tips. 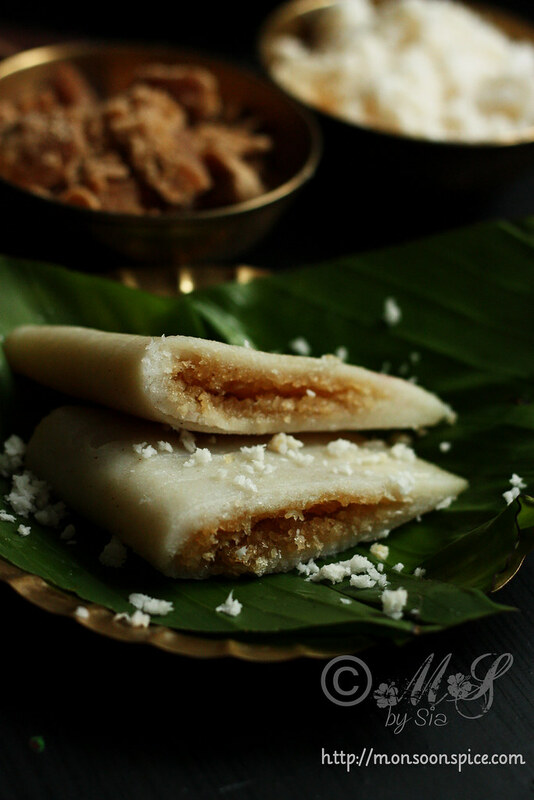 Keep flattening the dough with finger tips so that the dough spreads and stretches on to the leaf to a thin rice cake. Dip the fingers in water to avoid the dough from sticking to your fingertips. Once the dough is spread thinly (as shown in the photo above), spread about 1 heaped tbsp. 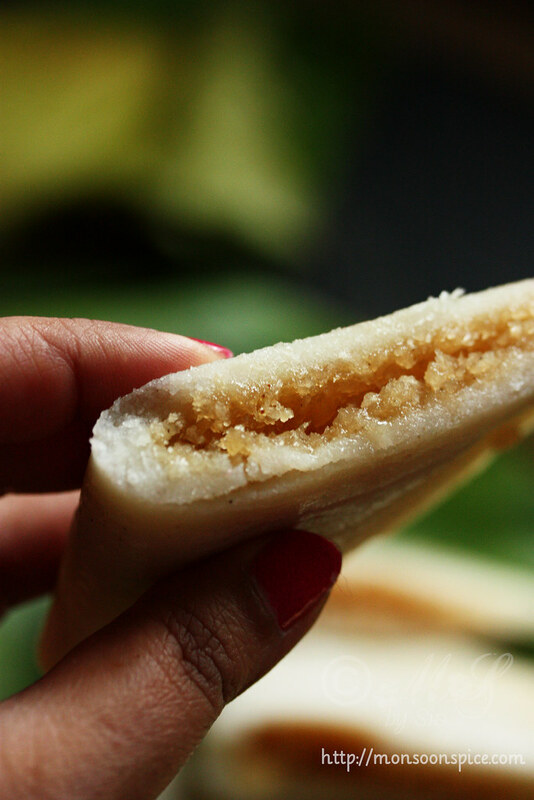 of sweet coconut-jaggery filling evenly on one half, leaving the edges. Fold the other half in the center and press the edges gently with fingertips to seal the edges well to avoid the filling from oozing out while cooking. Heat 2 cups of water in a steamer or idli steamer or pressure cooker without its weight/whistle and bring it to boil. Once you have prepared all the adas, place these banana parcels in a steamer bowl and place the bowl in a steamer/pressure cooker and close the lid. Let them steam cook on medium flame for 8-10 minutes or until the Ada is well cooked. Once cooked, remove the Ela Ada from steamer and place them on a plate. 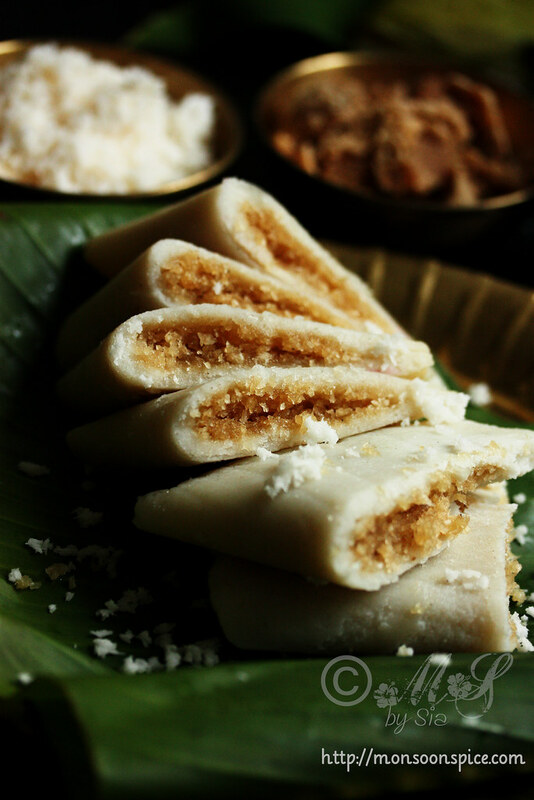 Let it rest for couple of minutes before serving them warm on their own or with a dollop of ghee and enjoy! You can substitute jaggery with sugar. 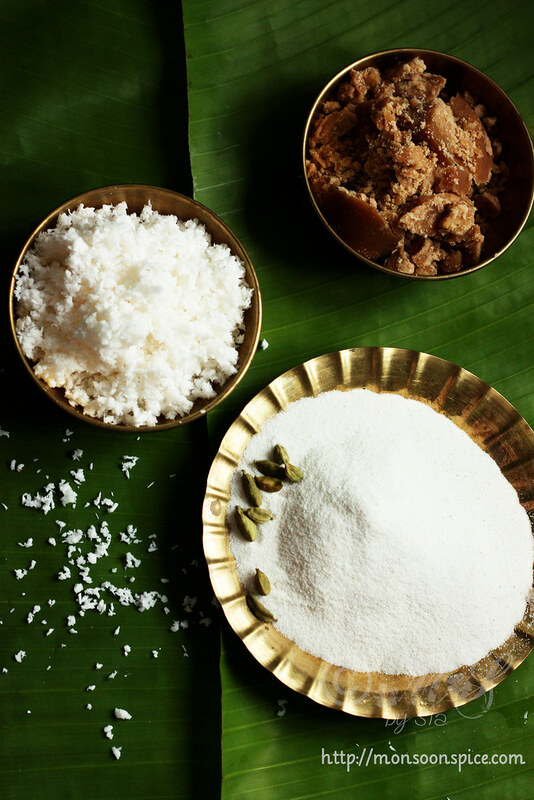 If using sugar, simply mix the coconut, sugar, ghee and cardamom powder and use it as a filling. You can add a tbsp. of cashew nuts and raisins roasted in ghee to the filling. 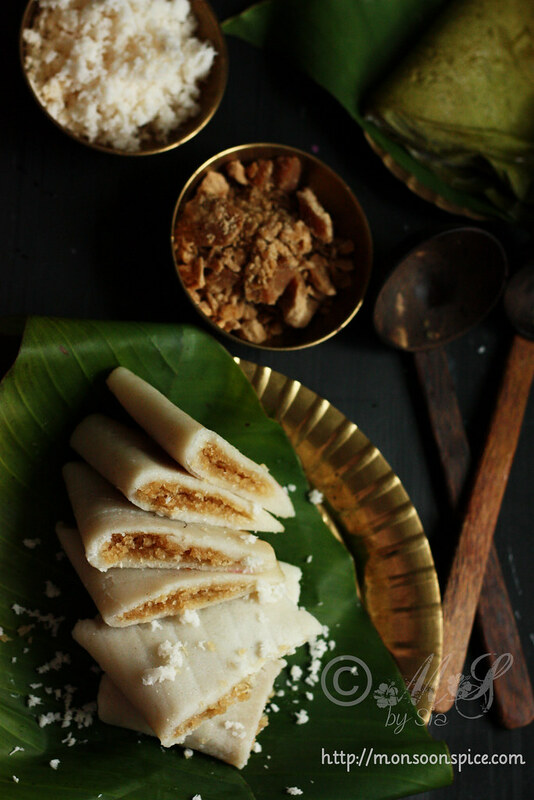 You can also add about ½ cup of chopped ripe banana to the filling for another flavourful filling option. If banana leaves are unavailable, you can replace them with parchment paper. 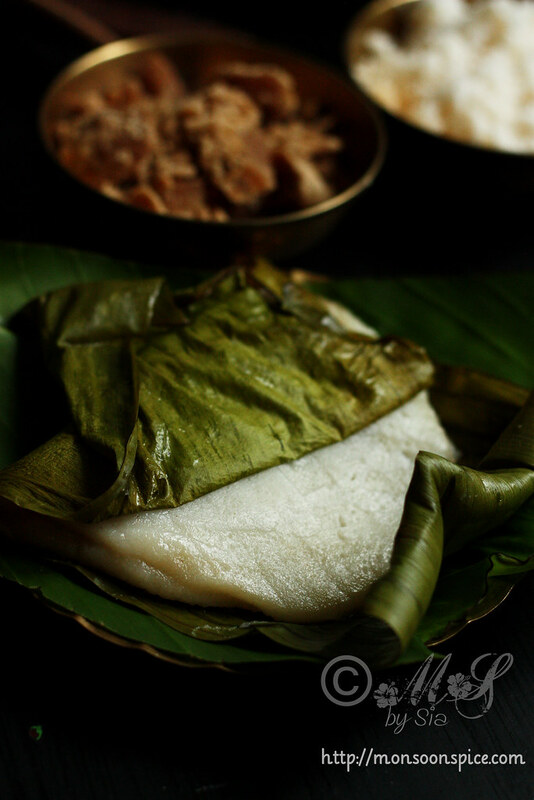 The end result will be a same delicious Adas sans the aroma and earthy flavour of banana leaves when steam cooked. Make sure to seal the edges of adas well in order to avoid the juice from filling oozing out when steam cooking. You can skip the Ghee to make it suitable for Vegan version. Sia, this is my favorite breakfast recipe. Some time back i made them by stuffing jackfruit. I have been reading your blog from some time and really like the way you weave magic with your words. Best wishes.